A STUNNING, SUSPENDED FIREPLACE DESIGN CONCEPT. In 2012 we were excited to facilitate the Canadian debut of the Tatiana 997 Centrale Open at our exhibit in the Toronto Interior Design Show. Today it continues to be one our most inventive and stunning products, unrivalled in both its aesthetic and craftsmanship. 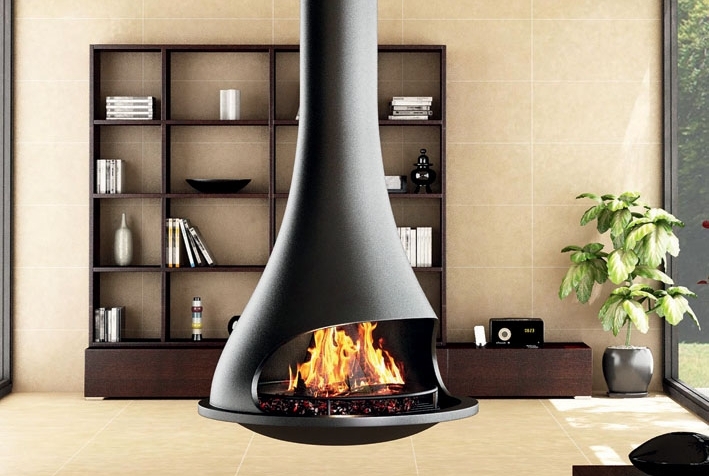 The Tatiana 997 Series by Bordelet features two styles of suspended woodburning fireplaces. The Tatiana 997 Centrale Open can be installed with a stationary mount, or with a revolving mount that allows it to rotate 360 degrees. The Tatiana 997 Murale Open is designed for installation against a wall, and is easily converted to house a gas burner system. These woodburning fireplaces are designed to burn open concept and are not available with glass enclosures. They are available in a variety of colours.